Last September a planet-massed gas cloud known as G2 made a close approach to the supermassive black hole at the center of our galaxy. At minimum distance it will pass within about 260 AU of the black hole, which is about a third as close as any other object so observed. It will be close enough that it will enter the hot accretion region of the black hole, and may provide the first observation of matter as it is absorbed by the black hole. 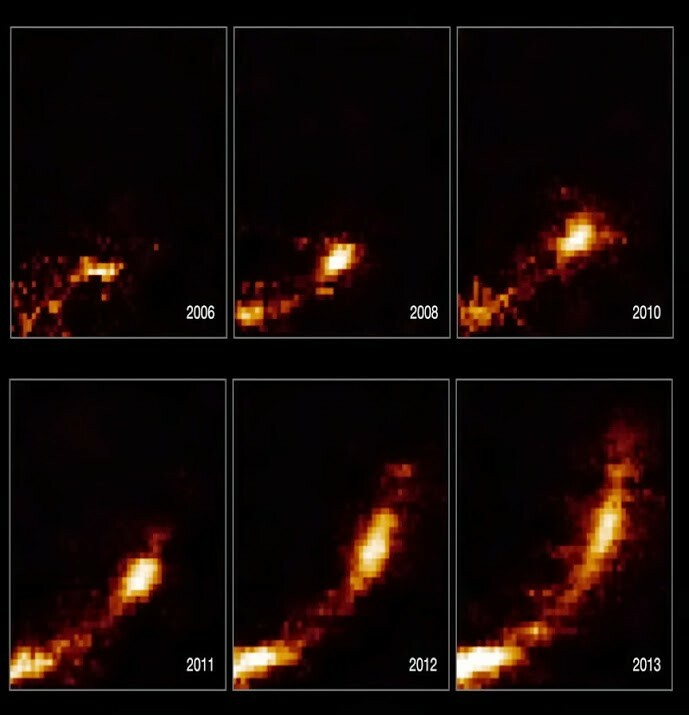 You can see observations of the gas cloud over the past several years in the figure below. Because the cloud is diffuse, rather than a compact object like a star, it will also provide a way to probe the region around the supermassive black hole. It is thought that stellar mass black holes might orbit close to the supermassive black hole, but these would be difficult to observe directly. However if any interact with the G2 cloud during close approach, their effects will be observed. 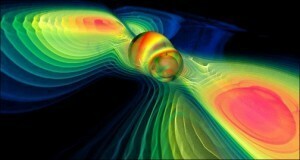 The reason why it is so difficult to observe has nothing to do with the supermassive black hole itself. It is only 26,000 light years away, which is rather close on astronomical terms. The problem is that it’s obscured by gas and dust, which blocks most light in the visible spectrum. To observe objects near galactic center, astronomers look for infrared and radio emissions from the region, which penetrate the dust more easily. But to get high resolution images, arrays of telescopes must be used, such as the Very Large Telescope (VLT) array. Currently the highest resolution observations are made in the infrared, and they resolve objects to about the size of Mercury’s orbit. In the future we may have even better ways to peer behind the veil. But this Fall, no less than six major observatories will be keeping an eye on the center of our galaxy to see what happens to this planetary cloud.